When the call came to foster parents Katie and Alvin Harley, the request was simple and direct: We have a baby, can you take her? But for Katie, that simple request began a day she’ll never forget – and prompted a picture that captures the joy that comes from a foster family’s love. Liliana was a victim of severe neglect; for the first four months of her life she was left in dirty clothes and unsanitary conditions all day and never learned to properly nurse or take a bottle (at one point, Katie said, caseworkers had to remind her biological mother that she needed to pick up and hold the baby when feeding her). As a result, she was severely delayed in her development by the time she reached the Harleys. A big part of Liliana’s advancement, according to Katie, was the support and love of her new siblings. “Everybody talks about the foster mom and dad, but the other kids in the family are just as important. I can’t say enough about what it meant to Liliana to have sisters and brothers teaching, loving and accepting her through all the doctor’s appointments and foster staff visits. 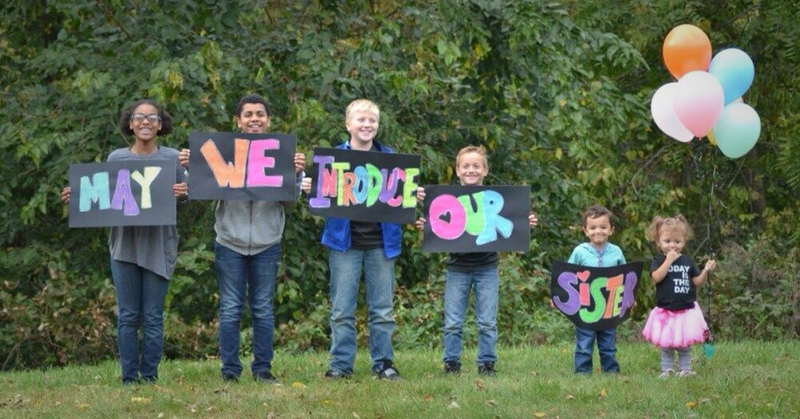 In the photo above (left to right) Maya, Levi, Mason, Jack and Noah – along with Liliana, who on October 11 was adopted by Katie and Alvin after more than 800 days in foster care.